Over the last few decades, I’ve spoken with hundreds of people who are getting ready for a capital campaign about their biggest fears. While I could make a list of campaign anxieties longer than your arm, three concerns come up again and again. If you’re heading into a campaign, you probably share these concerns. So here’s a description of the most frequently mentioned campaign concerns and specific suggestions of what you might do to address them. You’re afraid that your board members aren’t likely to step up. You’re concerned they won’t really pitch in to help. Every time the capital campaign comes up, they get very quiet and look to you. You know you can’t do this campaign on your own. So what can you do to get your board members excited and willing to really dig in and help make the campaign a success? Most board members are anxious about capital campaigns. They probably haven’t been through a capital campaign before and aren’t sure what will be expected of them. That lack of knowledge makes them anxious which is one of the reasons why they look to you when the subject comes up. Add to that the fact that most board members aren’t comfortable asking for gifts and you can understand their concern. It’s your job to find ways to help your board members become more informed and comfortable about how capital campaigns work and what their specific roles will be in the campaign. Distribute copies of books about capital campaigns that you can pass around the board. A short, easy read that conveys the key concepts is: How to Raise $1 Million (or More) in Ten Bite Sized Steps. For more in-depth reading, get Capital Campaigns: Strategies that Work. Engage someone to conduct a workshop for your board specifically on capital campaigns. Be sure that the person you engage is not only an expert on capital campaigns, but is also a good trainer. Invite board members or executive directors from other organizations that have been through successful campaigns to speak to your board about their experiences. You know who the largest donors in town are. Some of them give small annual gifts to your organization, but you aren’t close to them and you’re afraid they won’t make the very big gifts you’ll need to succeed. During the early pre-campaign phase of your campaign, develop a “depth chart” that matches donor names to gift levels. You’ll find a form for this in the Capital Campaign Toolkit. Once you’ve listed the names of all of the people who might reasonably make the largest gifts, develop a specific plan to draw each of them closer. Your primary task in this phase is to invite their help and learn more about their giving priorities. Remember that most of the largest donors have a great deal of experience in funding and fundraising. They can be excellent resources for you whether they wind up making those largest gifts or not. You’ve worked on a campaign or two, but you’re worried that you don’t have enough experience to guide a campaign from start to finish. You’re reading everything you can get you hands on, but even with that, you’re far from an expert. The Capital Campaign Toolkit will give you a clear road map for your campaign and the resources for each step. With it, you’ll know where you’re going and the exact steps you need to take to get there. Find a mentor who can be your guide. This might be a campaign coach or a consultant who will be by your side in the campaign. You will feel much better if you know there’s someone you can call when you’re not sure what to do. Create or join a small group of people who are working on capital campaigns that meets regularly to discuss their campaigns. You might create a support group from among your contacts or attend the monthly discussion for Capital Campaign Toolkit members. Going through a capital campaign will develop your essential fundraising skills in a way that no other kind of fundraising will. When you get over your fears and use every opportunity to learn about the process of raising large gifts, you will gradually become more confident in your skills. 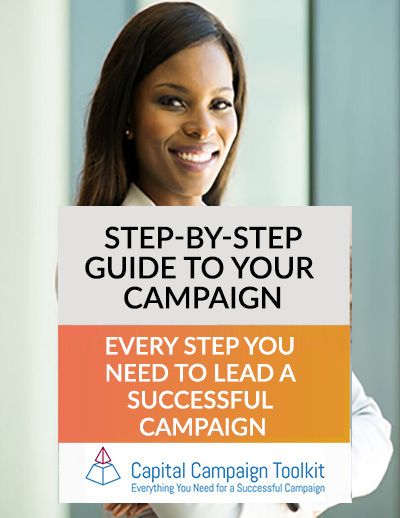 And once you’ve completed a successful campaign, you’ll never be quite the same again!